Hacienda Monte Cristo is unique. This Mexican style hacienda distinguishes itself from all the other cookie cutter condominiums on the island with its simple architectural beauty, consisting of curves, domes and arches. It's located in Country Club Estates, a safe, peaceful community comprised of private villas, only walking distance from a private beach, across the street from a golf course and a 10 minute drive from downtown San Miguel. Casa Falcone is one of 14 units, each one different from the next. It's decorated in a tropical theme with hand carved rustic furniture and adorned with artwork from local artists. The unit has an open floor plan with handcrafted ceramic tiles, hand carved mahogany woodwork, air conditioned rooms and incredible views. Relax on the beach or seek adventure - Cozumel has it all. My husband and I live in New York but we were married on the beach in Playa Del Carmen, Mexico. We decided to take the ferry over to Cozumel one day and fell in love with the island. There is just something about the place that keeps people coming back year after year. There are still so many parts of the island that are still unspoiled. We love the remote beaches on the ocean side of the island with the 'Corona bars' but we also love walking through the town square, mingling with the friendly locals, dining in the quaint restaurants. There's all that and yet you still have the water sport beaches if you are looking for more action. We decided to buy a place in Cozumel because we hope to be able to come down here for months at a time after we retire. Until then, we like to share it with other people of like minds who appreciate the unique qualities of this island. We decorated the place to look like a fun, festive Mexican hacienda. Everytime we go around the island, we find little accent pieces to go here or there. The paintings on the wall were done by a local artist. This was a labor of love for us. Just a few minutes away from a private beach with no rocks. Across the street from Cozumel Country Club which has a beautiful golf course. Cell phone loaded with sufficient minutes for local calls. Private parking area for the complex. Unit stocked with bottled water and paper goods. Nice selection of books for your reading pleasure. Nice selection of movies for those nights you may want to stay in. Small balcony overlooking the complex with outside bistro table and chairs. Private pool for residents only. Spa and yoga classes nearby. Gated community with a common rooftop area with barbecue grill, wet bar, swings, tables and benches. Panoramic view overlooking the lush jungle, the ocean and the golf course. 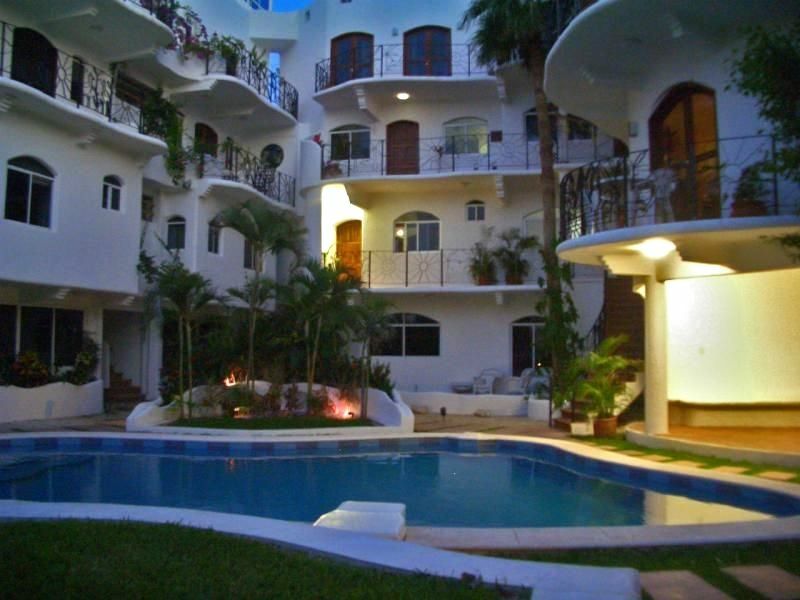 Nearby diving, water sports, spas, Yoga classes and golf. Located on the north side of the island in a quiet, residential area. A rental car is recommended as the condo is not within walking distance of town. Great location, roomy condo, safe, clean. The only comment would be it could use a better shower. Our family enjoyed the condo very much. There was a nice pool and private beach where you could see the sunset every night. The rooftop patio and grill where a nice addition although the wind kept us from grilling. You can also see the sunrise over the jungle from the roof. It gave a nice feeling of home instead of the sterile hotel feel. We used the kitchen several times and had everything we needed for our week. Could use this place for longer stays as well. We were here for New Years and it was quit and calm all night, unlike the rest of the island. Thank you for your nice review. We are very happy that you enjoyed your vacation and that Casa Falcone was a good choice for you. Authentic and Charming... just what we wanted! Casa Falcone is a beautifully appointed condo that has all the amenities one could hope for on vacation. The property itself is just gorgeous. The architecture of the place, the lines of the buildings / the gardens / the layout is so authentic and cozy. We are a family of 4 (kids 9, 11) and were very comfortable in the condo. The unit was spotless and inviting when we arrived. We didn't lack for anything. The kitchen is charming and cozy, and well stocked with everything you'll need for cooking (nice quality cookware), as well as small appliances. Bathroom is beautiful and roomy. Well outfitted. If you forgot something (chances are you'll find it there). It truly is a home away from home. The condo is comfortable with plenty of space. The high ceilings give an open and airy feeling, and perfectly decorated. I love, love, love the night lamps on the night stands. Stained glass that sparkles when lit. Closets and dressers are big and roomy... and LOTS of hangers (thank you!). So refreshing to have enough hangers (you all know what I mean). Beach bags, towels, chairs, cooler, noodles, floats... anything you could want is available. You'll certainly enjoy looking at the artwork, sculptures, and just taking in all the colors... which is so indicative of Mexico. The roof top bar and seating area was one of our favorite spots as we grilled almost every night. You don't get these opportunities often, so when it presents itself... you take advantage of them. My kids loved the swings... and so did I. It was great to take in the views and the breeze while having a glass of wine. Definitely a romantic setting at night. Don't skip it. We rented a car and glad we did because we went all over the place. Shopping is great at either Mega or Chedraui. They are ginormous!! A must do just for the experience. Lots of great local shopping, food, and sightseeing in the downtown square. Definitely great for souvenirs. The fountain light show is a great hit with the kids. Going further south on the strip, stop in at the Money Bar. Good food, and a nice spot for snorkeling. We came back a second day. There's so much to do just by driving around. Al and Colleen really take excellent care and pride in their property and think of every detail. The staff does a wonderful job. The management, Jim and Laurie, were very gracious. We can't wait to return... a most memorable and wonderful time! Our warmest thank you!! Thank you so much for such a nice review. We are so happy you enjoyed your stay. This was our 7th trip to Cozumel for Christmas. We had a lovely stay at Casa Falcone. There are definitely some pros and cons to this property which I detail below. Overall, it's a good value and for many travelers it could be just what you are looking for. Condo complex is small and has a beautiful pool and courtyard. Condo complex is very quiet and feels safe and homey. Both the owners and the property managers were friendly and happy to provide information quickly. Rooftop view is very nice. Short walk to access the beach. Pretty far from town. Without a rental car, it could be hard to get around. Because of it's location, there is not much opportunity to walk to dinner or anything like that. (But was manageable with a car). Too few bath towels and beach towels available to guests. They get gross pretty quickly. Thank you for your review. We appreciate any insights our guests can provide as we are always striving to improve in our service. I will definitely speak to our Managing Agent to make sure sufficient towels are available to our guests and to do an inventory of the kitchen cookware. I hope your overall stay was pleasant and you enjoyed your trip to Cozumel. What an amazing stay we had at Casa Falcone! The pictures on the website do not do it justice - absolutely beautiful! Everything in the unit is spotless and well-maintained. The grounds are gorgeous and the private beach just a few steps away was perfect! On a personal note, I would recommend renting a car - we found it was the best way to access downtown from the north hotel zone. My husband and I were truly depressed having to leave and board our plane back to the states. We will be back! We are thrilled that you were happy with your vacation at Casa Falcone. Thanks for your comments. The apartment is in excellent conditions and very well equipped. The swimming pool of the condo is nice and quite with shade during the day. The condo is very close to a quite beach with nice sand (no shade though!). Laurie the manager was very helpful. We rented a car and it was a great idea. It is a short drive to the city centre. We were scuba diving every morning, while grandparents and our 4 years old spent the morning at the apartment/pool/beach. It was very good. Amazing scuba diving, popular spot for kiteboarding. Many nearby businesses to book with.